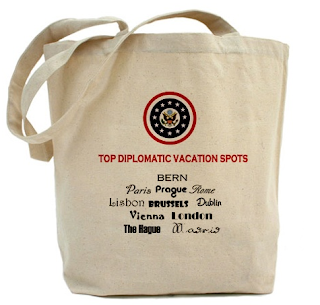 Who's Going to Our Top Diplomatic Vacation Spots? The London place occupies twelve and a half acres on the northwest side, so I agree that it is a good bargain, an exceptionally good bargain if I may add. There is also the Spaso House in Moscow, but apparently, not too many political contributors were excited about being consigned to the Russian Federation. As a matter of fact, among the five missions included in H.R.540, Russia is the only post that has consistently been led and managed by career diplomats in the last several years (16 years to be exact). The last five U.S. Ambassadors to Moscow including the incumbent are Foreign Service officers (John Beyrle, William Burns, Alexander P. Vershbow, James Franklin Collins, and Thomas Pickering). The last non-career appointee who lived in Spaso House in Moscow was Robert Strauss, a high powered Texas political figure who was America’s 19th and last ambassador to the USSR (1991), and our first ambassador to the Russian Federation (1992) under the senior Bush. I can't explain it - perhaps Moscow wasn't so cold then or perhaps now the deep pockets just realized it's not fun to get into a staring match with Vladimir Putin (so they left that to the professionals). In any case, today Al Kamen in Under Obama, the Envoy Convoy May Screech to a Halt (WaPo, November 6, 2008; Page A28) reports that "There is major agita among some key elements of President-elect Barack Obama's juggernaut. For example, the big-money types and "bundlers," the fundraisers who helped put together Obama's stunning financial advantage, are expecting their reward -- say a nice, cushy ambassadorship in Rome or Paris or London. (By tradition, about one-third of the nation's 190 ambassadors are political appointees. They're the ones who get the fine European postings.) But the chatter is that they'd better not count on it. The traditional sale of most ambassadorships, so aptly carried on during the Bush administration, may not continue." Uh-oh! All that work for nothing? Now, that's change I can live with. But how can you say goodbye to all these? Just to show you what these folks are going to miss, see below the diplomatic posts currently headed by non-career diplomats and have been that way (with very few exceptions) in multiple, consecutive assignment cycles. Look, not all non career ambassadors are awful (Mansfield in Tokyo, Admiral Crowe in London a while back are good examples), but checkbook diplomacy especially in this more complex and dangerous world is just not to our nation's best interest. Maybe they'll get that? Of course, our President should have the freedom to select his own personal representatives overseas. But qualifications should be the primary driver not the political money bag. Because. It's the right thing to do and we don't want a "Heck of a job Brownie" moment. Really. Here is AFSA's statement on ambassadors. More here on ambassadorships and presidential succession. That bill is not going anywhere but it's instructive.